As you squeeze everything but the kitchen sink, plus a couple of bickering children, into the already overstuffed car; as you programme the sat nav and try to ignore the fact that you’re going to hit every bit of traffic on the way to the site, already infuriated beyond belief, it might cross your mind that you’d have been better off keeping your mouth shut than suggesting a fun family camping trip. But with a well-equipped family tent on your side, you can have the best of both worlds: the outdoorsy experience, with none of the cabin fever. The compartmental nature of the family tent is a godsend. Separate sleeping areas give the kids some independence, privacy and responsibility for their own space, while keeping them safely within your sights; sharing a tent feels cosy, but the space means you don’t have to be under each other’s feet; and it means some can stay up and about while others can read or snooze without being disturbed. Domestic bliss in a holiday setting. What’s not to love? The trick, then, is finding the best family tent for your needs. If there’s an age gap between your kids, they’ll likely want their own “bedroom”, and so, too, will brothers and sisters. So plan your search accordingly: look for a bumped-up number of compartments, or a customisable model with zip-in dividing screens. If your time at Scouts was short-lived or the idea of trusting your offspring with the instructions is galling, look for an easy-build inflatable tent or one with a central pole, and consider the weight and size if you only have one pair of hands. 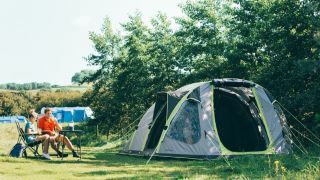 The Eurohike Buckingham Elite 8 is a real titan of a tent, with ample sleeping space for families and a huge communal area for socialising in the evening and regrouping for meals, with lots of headroom for moving around. Perhaps the best thing about this superb family tent, though, is its customisability. Dividers can be toggled in or out for privacy in the sleeping pods, and for £99, you can choose to add a porch. Reviewers have also noted that it deals admirably with hard, driving rain and wind. An all-round great (big) buy. Best for close friends or sleepovers in the garden, this 8-man, single-room tent from Clas Ohlson looks a bit like it should be forming part of a futuristic desert commune, but it has the functionality to back up the style. It’s high in the middle, with enough standing room to comfortably get everything set up without stooping, it’s breathable thanks to a mesh inner layer, and it stands up surprisingly firmly to wet and windy weather. This 6-man tent, with three huge bedrooms, a light living space, and even a compartment for storage, is part tent, part TARDIS, which explains the outrageous price. But it’s worth it. It really does fit as many as it claims without packing unhappy campers in like sardines, it’s waterproof and weatherproof with a sewn-in groundsheet and water-tight seals, and with two pairs of hands (it is huge, after all) you can get it up in record time. The best of all worlds, and a sound investment for annual campers. The 5000 Lite is a cavernous canvas bell tent that wouldn’t look out of place on a Mongolian plain. In short, it’s a bit new-age, but totally cool with it. With one large open-plan space inside, it might inspire horror in teenagers who are obsessed with getting as far away from you as possible, but in practice it’s large enough to give you all room to operate without getting under each other’s feet. Also, as the only traditional-looking tent on the list, it’s surprisingly easy to pitch. For camping novices, or anyone who has trouble with construction projects (you’re not alone), this ProAction six-man tent is a great little buy. Users state build times of 10 to 15 minutes, and with this tent’s lightweight polyester construction and fibreglass poles, plus super-handy colour coding, we can certainly believe it. Despite its seeming delicacy, it copes well in wet weather. Really impressive for the low price. Set up this spacious tunnel tent however takes your fancy: with a re-positionable partition giving you the option for a 3:2 or 1:1 split in the space, it’s easy peasy. That’s not even all of it, though. The Farnham’s communal living space is considerable, no matter how you set it up — and the light hook on the ceiling is a sweet thought — but the real standout feature is the porch, great for keeping muddy boots separate from clean interior floors. It’s not as roomy as the Vango AirBeam, of course, but if it’s the object of your desires, this is a good alternative for a much lower price. Kit yourself out with the right gear for you next camping trip, check out our guide to the best sleeping bags for camping.